Samsung Medical Center (SMC) is continuing to reduce dose without compromising image quality. With the installation of a premium X-ray system, GC85A, manufactured by Samsung Electronics, SMC is researching X-ray imaging with lower radiation dose while maintaining the best image quality. 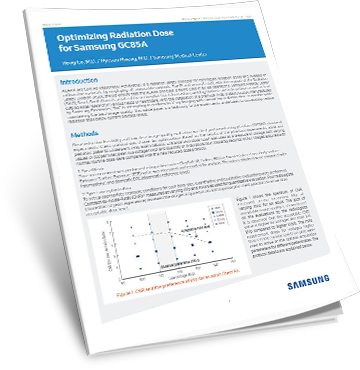 This white paper is a testimony to the experiments undertaken to successfully reduce radiation dose below current practice levels.